You wouldn’t necessarily think of Omaha, Neb. as a place for an interfaith collaborative involving the three Abrahamic faith groups but that’s exactly what it is thanks to the Tri-Faith Initiative, a non-profit moving ever closer to its plan for a church, a synagogue, and a mosque on a single campus. Like most Midwest cities Omaha’s a decidedly Christian stronghold with quite small Jewish and Muslim populations. It’s also a place where diversity hasn’t always been celebrated or embraced. Yet the Tri-Faith is an impossible to ignore reality here that’s making waves near and far. My story below, which is to appear in a future edition of The Reader (www.thereader.com), tries to get at how it is this partnership has been able to reach this point and find itself poised to realize something that perhaps has never been done before, anywhere. I’m proud it’s happening where I live. My blog contains a profile I did of Tri-Faith executive director Nancy Kirk, who like all the principals in this endeavor is a highly accomplished person of diverse interests. What unites them all is a sincere desire to do the right thing by moving past dialogue to action where interfaith relations are concerned. You’ll also find on this blog a story I did a few years ago on something called Project Interfaith and its director, Beth Katz, and a very long piece on the interfaith relationship forged by two famous figures, Rev. Edward Flangan, the founder of Boys Town, and his close friend and supporter, Henry Monsky. A smattering of other religious themed stories I’ve done are also on the blog. Omaha’s not always embraced diversity but the local Tri-Faith Initiative may be a history-making model of interfaith cooperation. It’s proceeding with an audacious plan to locate a church, a synagogue, a mosque and an ecumenical center on a combined 35-acre campus. Organizers say they’ve not found an equivalent gathering of the three Abrahamic faith groups – Christianity, Judaism, Islam – in a single dedicated setting. Not surprisingly, the project’s drawing much attention from media and scholarly attention. Observers are struck by how this partnership between the Episcopal Diocese of Nebraska, Temple Israel and the American Institute of Islamic Studies and Culture has gone from concept to dawning reality in only six years. The initiative echoes local community engagement efforts from the past – Citizens Coordinating Committee for Civil Liberties – and present – Ak-Sar-Ben, Omaha Community Foundation, Building Bright Futures, Empowerment Network – that coalesce various partners to tackle social-cultural needs. The Reader met with four “pioneers” behind the Tri-Faith experiment for their take on how the initiative has managed sustaining itself. They say one reason why this alliance has gotten so far so fast is that mere dialogue was never the end goal. Rather, it was a means to realize a brick-and-mortar sanctuary for promoting ongoing interfaith relationships. Outside the pitched battleground of the Middle East, Jews and Muslims have every reason to be friends. “I think Muslims are in a way in America the Jews of the past,” says Rabbi Aryeh Azriel of Temple Israel. “I think there is a tendency from time to time to select a new scapegoat. Jews are extremely aware of the ‘game’ that was played with their lives. We paid a price for being a scapegoat for many, many years. Azriel says progress between peoples of different faiths or cultures can only occur “when you’re able to step away from where you are and go to uncomfortable places.” Getting past surface niceties to deep interpersonal connections, he says, is what’s made the Jewish-Muslim relationship work in Omaha. Years before the Tri-Faith, he notes, Temple reached out to invite the Muslim community to celebrate Thanksgiving at the synagogue. Muslims have reciprocated by inviting the Jewish community to their celebrations. “It’s mainly about relationships. If you don’t visit each other’s home, if you’re not in relationship with people, the dialogue becomes completely nebulous and artificial after awhile,” says Azriel. It’s why, for him, meaningful interfaith exchanges must go beyond talk and tolerance to practice collaborative good works, such as creating a neighborhood where three faith groups co-exist in harmony. He acknowledges some Temple members resist the partnership. The other groups report similar reluctance or skepticism. It’s meant less than 100 percent buy-in. But that’s where Azriel says leadership can make a difference. “I really think a clergy that doesn’t challenge his congregation, doesn’t comfort those that are challenged, but also doesn’t disturb those that are comfortable should not lead a congregation. Sometimes you need to be stubborn and continue with the dreaming. So we continue walking on the bridge, even though at times it doesn’t look completely solid and safe. So what? There is a price to pay for daring and a price to pay for stagnation. In late 2011 the partners backed their words with financial stakes by announcing the purchase of adjoining parcels of land at the site of the former Ironwood Country Club, on the southeast corner of 132nd and Pacific, now part of the Sterling Ridge mixed-use development. The Tri-Faith vision took another major step to fruition when Temple, which completed its $25 million building campaign, broke ground April 15 on its new synagogue. It’s expected to open in August 2013. The other two partners are in the planning and fund-raising stages of their own buildings. A $2.5 million anonymous matching gift kick-started the Islamic Institute’s fund drive. A fourth structure, the Tri-Faith Center, will be a shared, nondenominational facility for educational-cultural events and activities. It’s also in the planning stage. The level of support shown for this faith-based collaborative defies the tensions and conflicts that keep different religious traditions apart. The feel good story of the project’s formation is already becoming lore. As the oldest and largest synagogue in town, Temple long ago outgrew its present facility. Whereas the reform Jewish congregation traces its history back to 1872 and serves 750-plus families, the Islamic Institute formed only in 2006 and counts but a fraction of Temple’s members. Still, the Institute needs a permanent home of its own to accommodate a growing Muslim population. Each cast its gaze out west, where most members live. Temple already had the experience of a Christian neighbor in First United Methodist Church to the north and of a shared parking lot with the Omaha Community Playhouse to the east. The Jewish and Islamic communities already enjoyed a rapport strengthened when, in the aftermath of the 9/11 terrorist attacks, Azriel led Temple members in a cordon around the local mosque as a show of solidarity. He and his Tri-Faith bretheren describe it as “a pivotal moment” that “forged” the relationship. Temple’s search for a new home took a collaborative turn when member and Tri-Faith board chair Bob Freeman broached the possibility of building with a faith partner. Not only would there be cost savings from a joint site selection and shared amenities, but opportunities to do interfaith programming. It wasn’t long before Azriel and Mohiuddin spoke about partnering. After consulting with their boards they decided to pursue an interfaith project with a Christian participant. After the Catholic Archdiocese of Omaha rejected the idea the Episcopal Diocese of Nebraska was approached. It just happened to be considering a new church in West O on land held in reserve. 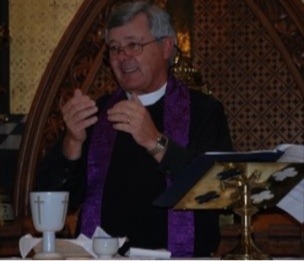 Then-bishop Joe Burnett asked Anderson to explore joining the two other faith groups in a joint venture. Anderson met Freeman over a game of golf to discuss the possibilities. Ironwood proved a symbolic spot for the Tri-Faith. It was founded as Jewish-only Highland Country Club in 1924 in response to Jews being barred from other clubs. Owing to Omaha’s declining Jewish population and a desire to be inclusive, Highland eventually opened to all who could afford it. Tri-Faith partners now refer to Hell Creek, which runs through the property, as Heaven’s Bridge. All of it plays well in the press. But as the founders take great pains explaining, none of it would have happened without the deliberate efforts of people committed to putting aside differences to make tangible an interfaith community built from the ground up. At the end of the day, says Freeman, it’s not platitudes or mission statements or white papers that drive the Tri-Faith. The Tri-Faith posed many potentially intractable, deal-breaker issues but Freeman says great care was taken to mitigate and mediate these. Azriel concedes that when there’s an international flashpoint in Jewish-Muslim relations, fears, insecurities and resentments surface. “Of course this comes up always as part of the discussion, issues of trust, of loyalty, of what-if scenarios. So you have definitely some of the Israeli-Arab conflict penetrating the conversation and people asking questions or suggesting that maybe its not the right way. It’s in breaking bread and participating in celebrations with each other, he and his colleagues say, that people of divergent backgrounds and beliefs find their common humanity. That’s why the Tri-Faith sponsors events that bring people of different faiths together. The Tri-Faith made its first big public splash in 2009 with the communal Dinner in Abraham’s Tent. An annual picnic is held. More events have followed, including workshops, panels, a children’s camp and high school programs. “We were able to establish positive momentum and credibility through programs and projects we pulled off very successfully,” Freeman says. “I think that was a crucial point in our relationships, that we could move through that and stay together and be of one voice against violence on any side,” says Anderson. Freeman says the Tri-Faith was able to draft a statement because the partners had set a precedent for addressing the elephants in the room. In other words, no prosleltyzing. A memorandum of understanding laid it all out. “An understanding was reached not to go after each other’s congregations to recruit members,” Freeman says. “We recognized the need to be separate, the need to be autonomous. There has to be autonomy. If any of the three want to do something internally in their congregation, in their building, on their land they have to be able to do that and neither of the other two should have any say at all in what that is. Certainly there can be a sensitivity to the impact that might have on your neighbors but nobody should tell anybody else how to govern or operate within their congregational religious life. Mohiuddin’s experience bears out Freeman’s words. “The most important thing we’re doing is expressing the beliefs we have and as a result we understand our own faith better than we did before because we have to explain it to people and that actually makes your faith stronger, it doesn’t weaken it,” Mohiuddin says. “I think we’ve become better Christians, Jews, Muslims by entering into this and trying to live out what our faith really says it’s about, and it’s not about politics, it’s not about power,” says Anderson. 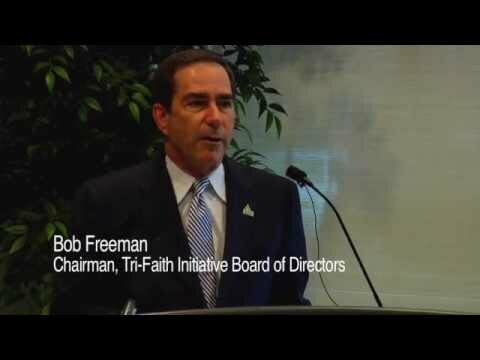 Freeman points to other things the Tri-Faith’s done to solidify itself. Two key professionals brought in were Nancy Kirk and Vic Gutman, Omahans with long experience in arts administration, communications and public event planning. 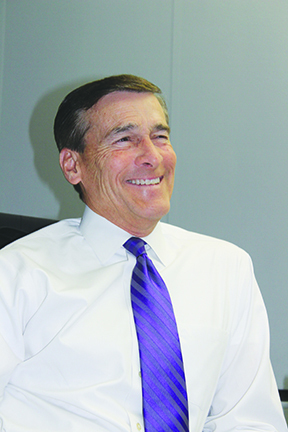 Kirk came on as executive director in 2008 and Gutman as media relations director soon after. On a more practical level, says Freeman, the partners are motivated to see the project through because it means a new house of worship for each faith group, plus an interfaith center. It’s the prospect of bringing these “homes” to completion, strengthening all three faith communities in the process, that supersedes everything else. The Tri-Faith pioneers welcome the attention the initiative is generating and hope their work provides a framework for more interfaith collaboratives. But Mohiuddin speaks for his colleagues when he says, “I can’t be distracted” from the work at hand. The partners have come too far now to be sidetracked and lose sight of the prize. Not when the campus Mohiuddin calls “our dream land” is so close at hand. Faith without action is dead and the Tri-Faith is nothing if not an action-oriented movement. One with a life all its own and a promised land to be filled. You captured the right spirit! Thank you! !